You think you know all about monsters? You don't! Say 'How d'you do' to an aging ogre; a willful monster who doesn't do what it's told; a ghost who came to tea and put 'swashbuckling' into mealtimes; tricky Kleptomania who can't stop disappearing things (will she take the school? ); a dragon; a gorgon with a conscience; a wheeling-dealing zombie and a hydra that wished it didn't come for dinner. These are only some of the monsters you'll meet, but watch out, there are others... you know the sort - disgusting, rude or emitting dangerous screams. A few are captured in here... but most of them are out there... living around you. You may even know one or two. 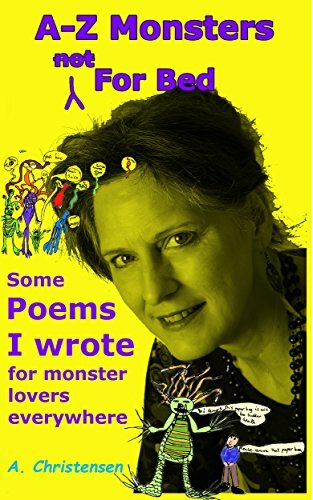 These funny and pacey monster rhymes will make you splutter and guffaw. They'll have you checking behind you, or wondering what it was you saw out of the corner of your eye or pondering the fate of poor old Quantum Querulous. *26 rhymes for 26 letters. Just because they are alphabetical doesn't mean they're only for children. Deeper messages are afoot. "Chucklesome gore from start to finish"